The global compound chocolate market is projected to register an estimated CAGR of 6.31% during the forecast period of 2018-2023. Increasing demand of low priced cocoa based products has increased the demand of compound chocolates, globally. The major market drivers include increased price of cocoa butter, limited supply of cocoa products in the market, cheaper price of compound chocolates, and increasing demand in industrial and bakery applications. The technical advantage of non-requirement of tempering and easy manufacturing process has increased the industrial demand of compound chocolates. However, the regulation on adding vegetable fats in chocolate, by various regulatory authorities, has restrained the growth of the compound chocolate market. Other than the regulation on vegetable fats, major factors restraining the market growth includes unhealthy nature of cheap vegetable fats, along with consumer preferences for the pure chocolates among others. The compound chocolates are used in industrial applications of bakery & confectionery products, as direct chocolate end-consumers, and in ice creams. The increased demand of coatings & coverings for the bakery products has raised compound chocolates’ popularity among bakery applications. The market is sub-segmented by the product type, as compound chocolate chips, coatings, slabs, and others. The chocolate chips are used in products, such as ice cream, biscuits, and cookies. Chocolate slabs are utilized commercially by manufactures for industrial applications, where it is melted and further processed into final product. Compound chocolate is mostly produced in developing regions, such as Asia-Pacific, which accounts for the highest production of compound chocolate. The countries in the region extensively export to developed countries, like the United States and Canada, among others. 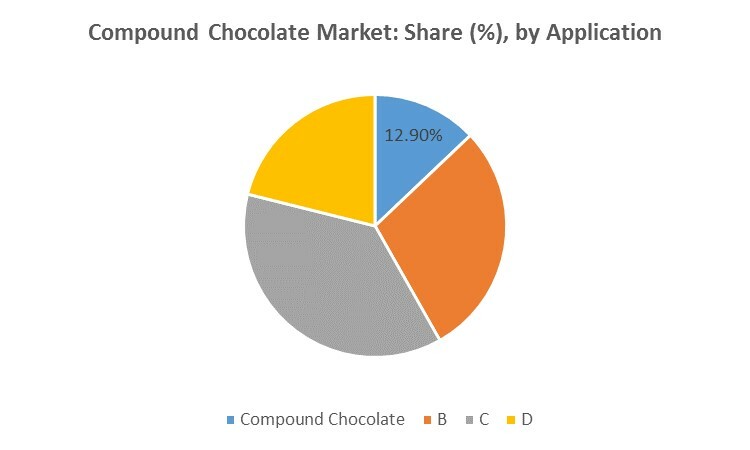 Increased advancement in technology and the chocolate crisis in the market have provided to be a great opportunity to the compound chocolate market. Asia-Pacific region accounts for major share, owing to its affordable cost, while the stringent regulatory barrier is being a big challenge for the market. The compound chocolate market is dominated by the small-scale domestic manufacturers and few major companies. The major competitors prefer investment in new product development with more functional properties and marketing strategy for maintaining their market position. Major Players: Cargill, ADM, Palsgaard, Barry Callebaut, Wilmar International, and Flanders Filings & Compounds (backed by Fuji Oil Europe).